Registry Auditor gives you a quick look at the Adware, malware and spyware installed on your PC including parasites and trojans. Registry Auditor tells you by colored icons ( green icon - safe, yellow icon - unknown, red icon - harmful ) whether specific Objects are known to be safe or harmful, also the program searches the registry for entries including filenames that aren't present on and allows you to delete unwanted registry entries. Version 2.4.6 is a freeware program which does not have restrictions and it's free so it doesn't cost anything. 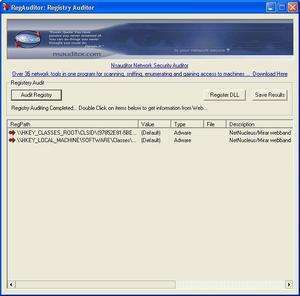 For security reasons, you should also check out the RegAuditor download at LO4D.com which includes virus and malware tests. Additional screenshots of this application download may be available, too. 4.67 out of 5 based on 15 ratings. RegAuditor has a presence on social networks.